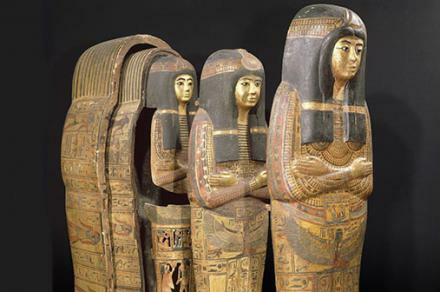 The Egyptian elite was buried in a coffin placed inside another coffin – in ensembles of up to eight coffins. This was intended to ensure the transformation of the deceased from human to deity. Everybody knows the ancient Egyptian practice of mummifying their dead. What is perhaps less known is that they placed the mummies inside layer upon layer of coffins. Boxes and other forms of containers are technologies that arise at given points of time in various cultures. A similar idea can be found with Russian dolls, Chinese boxes and even Norwegian poetry traditions. “The Egyptian coffin sets are based on the same principle that we can observe with Chinese boxes and Russian nested matryoshka dolls, where objects are nested inside each other to constitute a complete ensemble,” says Anders Bettum, Egyptologist at the Department of Culture Studies and Oriental Languages, University of Oslo. Ancient Egyptian history encompasses a period of nearly three thousand years, up to the Roman conquest in the year 30 BCE. Today, museums all over the world possess mummies or coffins that have contained mummies of more or less prominent men and women. The child king Tutankhamun (1334-24 BCE) was buried in as many as eight coffins, according to Bettum. “For men and women who were members of the ancient Egyptian elite at that time, three or four coffins were not unusual,” he adds. According to the researcher’s recent PhD thesis, Faces within Faces – The Symbolic Function of Nested Yellow Coffins in Ancient Egypt, nested coffins were not only a status symbol for the Egyptian elite. “They also played a key role in the process that would link the deceased to their ancestors: to Osiris, the god of the afterlife, and to Amun-Ra, the sun- and creator god,” says Bettum. The rituals and the myths that were reiterated during the seventy days that a funeral lasted are symbolically rendered on the coffins. The components of each nest, including the mummy-cover, the inner and outer coffins – reflect the Egyptians’ view of the world. The choice of colour is not coincidental: it represents the light and its origin in the sun. "That the figure of Osiris is being bathed in sunlight can, in my mind, only mean one thing. The decoration invokes a well known mythical image: when the sun god arrives in the throne hall of Osiris in the 6th hour of the night and the two deities join in mystical union," says Bettum. According to the Egyptians, this union was the source of all regeneration in nature, and it was here, at the centre of this ‘catalyst of life’ that the deceased wanted to be placed for all eternity. Another key finding, Bettum explains, is that the innermost layers of the coffin nests dating from the 19th dynasty (approximately 1292-1191 BCE) were fashioned as living humans in their best outfits. The innermost layer was the most important one, since it shows the objective of the afterlife transformation: the “state of paradise” to which these people aspired involved not only a mystical union with the gods; but more importantly a return to their old “self”. Bettum believes that this custom served to distinguish the sacred from the more mundane surroundings. Even though complete Egyptian coffin nests still can be found intact in some places, most have been disassembled and are today scattered in museums all over the world. As a researcher, Bettum would like to see more international cooperation to reassemble the coffin ensembles in the same location. He also believes that such projects would be fascinating to the public and rekindle interest in some of the world’s largest and most enigmatic cultural treasures. “So far, national legislation and interests have unfortunately served as barriers to such cooperation,” he concludes.